Just as the body needs physical nourishment, so the mind needs its nutriment. It is hungry not only on special “feast days,” but every day of our lives. Charlotte Mason exhorted us to “eat” ideas so we might live everyday. Many questions come to mind: What does my everyday living look like? What nutriment did I take in throughout the day? What was the nature of this food? Was it hearty and plentiful, or processed and meager? The daughter first explained why and then answered vaguely she was reading “some books a friend gave” her. She brought the books out; they consisted of the usual tabloid books for young people—sensational plots and self-absorbed characters. After a healthy exchange of questions and discussion between mother and daughter, they decided that the classic literature, not just any book, would be her daily sustenance. And, is it a surprise to note, the vitality of the young woman changed in no time at all. Are we what we eat, intellectually? Does it make a difference in the life of our minds if we spend the evening surfing the Internet, browsing Facebook, scanning tabloids of the famous and infamous or sitting with a rich text on history or theology, reading on art or nature, or enjoying a well-written novel? One of the most encouraging facts that Charlotte Mason draws out about education is that the Holy Spirit is our teacher. All knowledge is revealed by God to human minds. I believe this, but instinctively I find myself thinking that I need to "dress up" the well-chosen text with some creative sparks of my own. I check this instinct and remind myself that a well-chosen text will carry with it ideas that will nourish my students' minds without any extra table decorations by me. In fact, my "clever" decorations really would only get in the way between the text and the Teacher. I was reminded of this recently when my six year old was walking with me to the car and spontaneously said "You know mom what you were talking about with Seurat about gaiety, serenity and sadness? I already knew what you were talking about because I have experienced those before." He was referring to the artist study class from at least a week prior where the text quoted Georges Seurat as saying that "art is harmony" and went on to say that harmony was achieved by the use of color, tone and line. Line can show gaiety, serenity or sadness. i defined these terms for the class before reading the text. Somewhere between that lesson and our conversation, my young son reflected on these states of mind and saw in them his own. The Holy Spirit took the lesson from the text and applied it to his life thereby making the text alive to him and allowing him to experience greater awareness of his own life of the mind. I appreciate that I have learned from Charlotte Mason not to get in the way of the text by fancy decorations or by changing the author's words to ones that some would feel are more "child friendly." Would happy, calm and sad have captured the essence of what every human experiences at deep levels - even six year olds? Would such words have caused a six year old to meditate on the states of mind that Seurat sought to evoke in his paintings? Could I have added anything to this beautiful text or the Holy Spirit's use of it in my son's life? No at every point. Next, we perceive that knowledge and the mind of man are to each other as are air and the lungs. The mind lives by knowledge; stagnates, faints, perishes, deprived of this necessary atmosphere. A Philosophy of Education, 324. Charlotte Mason speaks about knowledge in a personal way. It is not mere information; nor is it to be confused with learning. It is conveyed by Spirit to minds prepared to receive it. It is mysterious, but it is the way one grows and becomes more of a person. Growth is what God intends for us. Yet, growth does not occur if mind does not encounter, and receive, knowledge. Some weeks past, I was reading with fourth graders about description. Working through a paragraph by George Eliot, we came across the phrase happy irregularity, describing the growth of lichen on a brick wall. Eliot personified what she saw and these young readers received knowledge of lichen, description, and the beauty (and proper use) of language. This encounter conveyed meaning to the students and was added to their lives in the form of knowledge. What do they have to show for the time spent with this paragraph, for their minds encounter with knowledge? They give attention to words, to meaning, to lichen. They have become more of what it means to be a person; they have grown. Ideas may invest as an atmosphere…'The idea may exist as… a mere instinct, a vague appetency towards something, . . . like the impulse which fills the young poet's eyes with tears, he knows not why: To excite this 'appetency towards something'––towards things lovely, honest, and or good report, is the earliest and most important ministry of the educator. Ideas are in the air! It is the work of the educator to awaken the student to these ideas in this thought environment through her being. Direct teaching does not convey these affections. It is in the atmosphere, a force in formation, all around, natural – emanated by persons breathed in by those in relationship, a student with his teacher. Look, tones, words, and actions are transported in the thought environment from person to person. And actions rise from what has been taken in and from what has been omitted. The questions before the educator are, what is in the air emanated by me and is it worth passing along? Charlotte Mason, Parents and Children, 36. At Ambleside we often discuss our “paradigm shift’: from textbooks, grades, and stickers to “living books,” “narrations,” and “habits.” It’s difficult, for many of us. We’re not just learning about a method of education; we’re learning again how to learn. Often I hear a parent say, “I’m glad my kids are getting this kind of education.” You ought to be glad. I would know. I was one of them. Before I was sixteen years old, I had never received a formal grade. I wrote my first formal essay when I was fourteen. We used a science textbook once for about two weeks before my mother threw it out. In our home there were no workbooks, stickers, rewards, or detentions. We were expected to do as we ought, because we ought. You see, I was blessed to grow up in a Charlotte Mason homeschool. My mother read For the Children’s Sake while my sister and I played pioneers in the woods or drew the solar system on the sidewalk. Our school day was full of books and more books. Queen Elizabeth, Bilbo Baggins, the planet Saturn, Purple Coneflowers, and Leonardo Da Vinci were among our daily acquaintances. We told back in the car, in the kitchen, in copybooks that are still stacked in the backs of our closets. Education in our home meant the direct confrontation with real things – real books, real nature, real ideas – and the struggle that follows as your mind digests new knowledge. “The mind feeds on ideas,” Charlotte Mason wrote, “and therefore children should have a generous curriculum.” From a young age I was privileged to feed deeply and widely at a banquet of knowledge. We learned about ideas, not just facts. And we cared about what we learned. We cried when Beth dies in Little Women and became outraged at Benedict Arnold’s treachery. Everything we read took root inside us, and we lived it. This is a joy that I still get to experience alongside my students each day, in my Ambleside classroom. I see the excitement on their faces, and I recognize it, because I have felt it, too. At times, I think our method of education seemed frivolous to outsiders – as though my parents weren’t concerned enough about our preparation for college or the workplace, as though they were gambling with our future. But a Charlotte Mason education is an inheritance within. Jesus said, “The good man out of the good treasure of his heart brings forth what is good” (Luke 6:45). On the outside this education may seem impractical, but on the inside a child has amassed a treasure beyond rubies – and certainly beyond any career goal or college award. I have never wished that my parents had given me more tests or grades, that they had replaced our family love affair with learning with a staid set of workbooks and drills. But I daily feel thankful for the riches of my education. As we partner in this great work of education, let us remember that we are feeding the souls of persons, who deserve to feast on the riches of God’s creation. One day, they will thank you for it. We often distinguish the order of things by considering the importance of their ends. To being a good businessman, a successful professional woman? Success is not a good [end] to have in view [for education]. If people only ‘get on’ to success they still have very far to go. Perhaps every child — every person — must ‘get on’ to a different kind of success, … to live the life God has given him in exactly the way God intends him to live it. To have this power, the person must be at his best, must be a complete person ‘mind, heart, soul, and strength,’ and must know how to choose the good and refuse the evil. Essex Cholmondley, The Parent’s Review, 1950. At the beginning of each New Year, I reflect on the order of things — relationships, time, and professional pursuits. What is in order and what is disorderly? What does it mean to re-order and put things in the right order? “Other orders” have been available to human persons since the beginning of time. Among our particular 21st century challenges is the array of “other orders” that present themselves via technology, affluence, and entertainment. This sense of license appears in the life choices of the self-ordered, and in the manner that they relate to their children — the means are not intentionally ordered to their end; they are plucked out of the air of the moment. James Schall, The Order of Things, 11. One of the things I love about the mathematics curriculum at Ambleside is that for each new concept taught, the student is led to discover how and why it is true before they put it into practice. The textbook and workbook refer to this as "Telling the Truth". I have been focusing lately on having the boys format their assignments in a more neat and organized way, using the formatting guidelines provided by Ambleside. 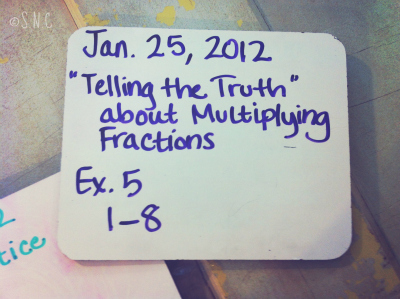 For their math assignments this includes writing the title of the exercise they will be working on. How many lies have multiplying fractions been telling me? "Training for the work of eternity"
This is my first blog entry for Ambleside, although I have been educating our sons using ASI support for three years. I must admit at the outset that I am a bit reticent to write a blog. This is because I lack familiarity with the medium (I don't read blogs in general) and because I am more of a private person than most Internet users (point in case: I don't have a Facebook page and don't know how to access any). So the question is begged: why am I writing a blog now? Because I am grateful to ASI for the support I have received for home education and I want to offer my support, albeit in a small way, to ASI and to parents who are on the same journey as us. If I can be one seed of encouragement in the productive soil of another homeschooling family and if I can point others to the rich philosophy of Charlotte Mason as applied by ASI, then my entry into the world of blogging will be time well spent. In the weeks leading up to the start of a new semester (as I am in right now), my heart always cries out to God to direct our paths and to lay His hand of blessing on our feeble efforts to raise sons for His Kingdom. I am always struck by my weakness in this task while having full conviction of Jesus' call on my life to raise our sons in this way. A hard combination: weakness and requirement. It necessarily lays me at the feet of Jesus asking for His empowerment, which He unfailingly gives. These weeks between the fall and spring semester have been no different. Interestingly, I also often end up reading a biography of a saint during our school break (such as Charlotte Mason, Elizabeth Elliot, Corrie ten Boom, Hudson Taylor), and I did this last week as well. The biographies always challenge my heart to ask "In what ways I am living only for Jesus and only for His designs and desires in my life?" This last week I read Faithful Women and Their Extraordinary God by Noel Piper, which briefly tells the story of the lives of Sarah Edwards, Lilias Trotter, Gladys Aylward, Esther Ahn Kim and Helen Roseveare. These women lived in times and places that were severely challenging to them on every level. I live a life of relative ease and I can't help feeling disturbed by this. There are a lot of issues raised by these thoughts. But as I have meditated on these lives, God has reminded me again that He appoints the times and places of each family and calls us to faithfulness in that time and place. One sure place of appointment for me is in my home educating my children. Each day, as Lilias Trotter reminded me, is "training for the work of eternity." I am keenly aware of this fact and responsibility and the graces of God that accompany our knee-worn obedience. Thoughts like these are in my mind as I prepare for the new semester by reading books such as the arithmetic book that arrived this week, Abigail Adams last week, and Georges Seurat that should arrive today - to name a few of our beloved guests this next semester. Not every entry of mine will be on the abstract level, I assume. As I get into the semester I will wrestle with more practical issues, as usual. However, what do I know? I have never blogged before...until now. I recently read an article entitled, Why Do Some People Learn Faster? by Jonah Lehrer. It alerted me to how I respond to failure; both my and my children’s. 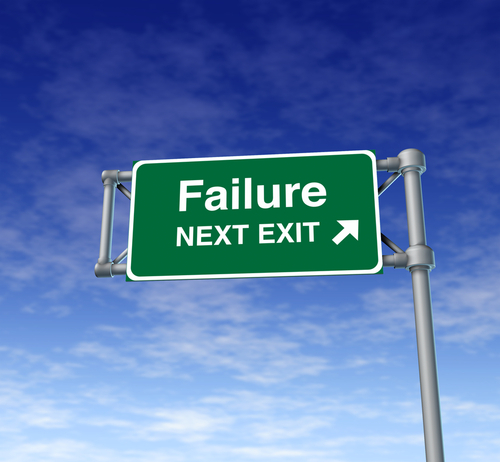 As failure is part of success, it is a necessary element to learning. Basically, failure is okay - in fact it is good. When I fail, I learn what not to do or what won’t work and then I can approach my task with a new approach as well as a more developed resiliency. Partly because of this article and partly because of our text used for citizenship, A Book of Courtesy by Sister Mary Mercedes, we have been inspired to eliminate all negative self talk from our school and home. It is too easy to say things like, “that was stupid” or “I’ll never get this” or otherwise pessimistic comments when we fail. This is wrong and not helpful. In fact it hinders our success. My response to failure both as a mother and a teacher is crucial to my children’s success in life. I am teaching them how to respond to failure as it will happen, and often! It is important for me to say things like, “No worries. That’s okay. Let’s try again.” or “Okay, that didn’t work so let’s try something else.” I now make sure to tell my children that failure is a natural part of learning and it is okay to fail. To learn and to grow we must be willing to take risks. A fear of failure will prevent us from taking these necessary risks. If we put forth our best effort in our endeavors and see our failures as steps on the road to success we will grow and we will learn. But if we do slipshod work and are afraid of failure and thus don’t take risks we will remain stagnant. Once again I am reminded how important my own emotional health is in developing my children into mature men and women.